MyClubV2 is a powerful Social Club Management Solution with inbuilt Reporting and Email distribution functions to keep your Members fully informed. MyClubV2 organises your Membership, Meetings, Motions, Agenda's Correspondence, Contact Notes enabling you to quickly lookup past data and manage future events. An easy to learn and intuiative interface will have you up and running quickly enabling you to save time and effort. ...... Your Reports, Agenda's etc will have a consistent and professional look and feel giving confidence to your Members that your Club is being well managed and administered. The email facility and the ability to save reports in pdf format will enable you to send out Meeting Notices, reminders, Reports, Newsletters quickly and at the touch of a button. You will be able to prepare all your reports on one integrated environment - no more separate word processing, database, email setup to worry about. Qweas is providing links to MyClubV2 2.5 as a courtesy, and makes no representations regarding MyClubV2 or any other applications or any information related thereto. Any questions, complaints or claims regarding this application MyClubV2 2.5 must be directed to the appropriate software vendor. 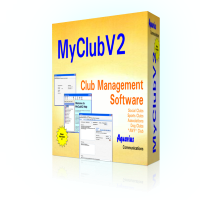 You may click the publisher link of MyClubV2 on the top of this page to get more details about the vendor.